This week marked Henry Ford Health System’s 21st Annual Quality Expo. The Quality Expo, hosted at Henry Ford Hospital, offers an opportunity for all of Henry Ford Health System to showcase the innovations and improvements made by our employees, departments and hospitals in the areas of health care quality, patient safety and care delivery. Leo, a therapy dog at Henry Ford Wyandotte Hospital, is one of the most remarkable therapists that I have ever encountered. 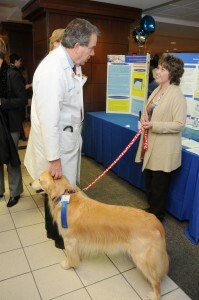 Leo and HFWH’s Pet Therapy Program were featured at the Quality Expo. Henry Ford is the only health care provider in southeast Michigan to host such an event. The Quality Expo’s features 70 projects, all of which are aimed at reducing medical errors and improving patient safety, quality and satisfaction. As always at this event, I was truly impressed, as I walked through the poster presentations and spoke with colleagues, by the tremendous work being done by our health care teams to continuously enhance quality and safety throughout the system. I did stop to see one of our employees, Leo, a therapy dog at Henry Ford Wyandotte Hospital. Leo is one of the most remarkable therapists that I have ever encountered. He is calm, friendly, and extraordinarily soothing, and part of a great program of pet therapy throughout our System. Within minutes of being with him, all of my concerns and anxieties were gone. Not long ago, I spent some time walking in the shoes of Richard Ford, an electrician at Henry Ford Hospital who handles everything from keeping the music playing in the hallways to maintaining our overhead paging and fire systems. This time around, I spent some time “riding” in the shoes of John Snitgen, a dedicated police officer who has worked at Henry Ford Hospital for more than 10 years. John and our entire security team are responsible for keeping our hospital campus safe, and I learned more about some of the complexities our police officers face. And they’re doing a great job: Thanks to our police officers, the crime rates on our campus are similar to or lower than reported crime rates in many suburban cities, such as downtown Birmingham.